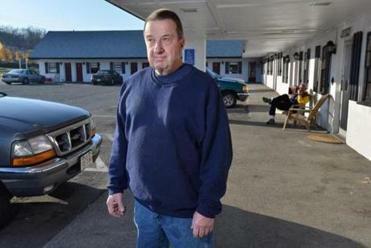 Russell H. Caswell, outside his family’s motel on Main Street in Tewksbury, is awaiting a ruling on his legal battle with the US government. TEWKSBURY — For the fourth consecutive year, members of the Caswell family will spend the holiday season wrapped in a cloak of uncertainty, not knowing whether they will lose everything they have worked their entire lives to build. 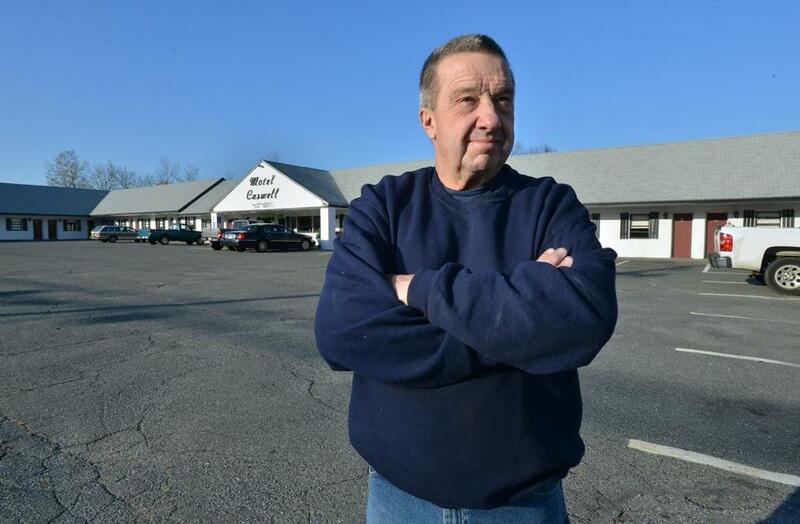 Russell H. Caswell, 69, the family patriarch, has been locked in a battle with the US government since September 2009, fighting to save the motel his father built in 1955 on a slice of commercial property that hugs Route 38, the main artery through Tewksbury. The motel is the family’s only notable source of income, supporting four generations. Although he has never been charged with — or even accused of — any criminal wrongdoing, Caswell has been forced to defend his property in a protracted legal battle that reached a milestone earlier this month with a four-day trial in US District Court in Boston. The central focus of the trial was a little-known civil asset forfeiture law that allows the federal government to seize property linked to drug crimes. The fate of Motel Caswell rests in the hands of US Magistrate Judith Gail Dein, who is expected to decide within a few months whether the government can take the 56-room motel, an asset worth more than $1 million, based on a number of incidents over a 14-year span. It may not be the Ritz — its modest rooms are typically used by travelers looking for a cheap place to stay ($56 a night) off Interstate 495’s Exit 38, or locals who are between permanent homes, renting by the week or the month — but for the Caswells, the motel is all they’ve got. A timeline traces the US government’s civil lawsuit seeking to seize the Motel Caswell in Tewksbury under the federal civil asset forfeiture law. The case, Caswell said, has little to do with illegal drug activity and a lot to do with money. The Caswells have no mortgage on the property, making it an attractive target for law enforcement officials looking to bolster their budgets, the motel owner said. Under a process known as equitable sharing, the federal government would pocket 20 percent of the proceeds from the sale of the property; the remaining 80 percent would go to the Tewksbury Police Department. This week, lawyers on both sides had the opportunity to finalize written briefs supporting the arguments they presented at trial, with the documents due to be filed by Thursday. Dein is expected to hand down her ruling after the new year. Caswell, who runs the Main Street motel with his wife and two children, said he is optimistic about the outcome. At the conclusion of the government’s case, Dein said she had “serious concerns about the government’s interpretation” of the federal forfeiture law. Officials with the US attorney’s office could not be reached for comment, but at trial the government stated that it has the right to take ownership of the motel because there was a “substantial connection” between the property and illegal drug activity, and Caswell knew — or should have known — what was going on, and should have taken all reasonable measures to stop it. Russell H. Caswell says his family installed security cameras and took other steps to limit drug-related activities at the motel his father opened in 1955 on Route 38 in Tewksbury. According to federal prosecutors, some of Motel Caswell’s rooms were used to facilitate drug activity between September 1994 and November 2008. The government cited 15 drug-related incidents and 19 arrests during the time frame, including a fatal heroin overdose in 2007 and the police discovery of a methamphetamine lab in one of the rooms in 2005. In an interview with the Globe, Caswell’s lawyer, Scott Bullock, was quick to point out that those incidents represent less than 0.05 percent of the 125,000 room rentals at the motel during the 14-year period. Bullock is a senior attorney at the Institute for Justice, a libertarian public-interest law firm based in Virginia, and is handling the case pro bono. At trial, Bullock said the government “is just totally wrong in its interpretation of the substantial connection requirement,” and noted that Congress in 2000 had amended the law to make it clear that merely being the site of a crime does not make a property subject to forfeiture. During the trial, Caswell said he was unaware that he could be in trouble for the drug activity at his motel until October 2009, when he received a notice in the mail informing him that the government intended to seize his property. The complaint for forfeiture was filed Sept. 29, 2009, Caswell’s 66th birthday. At first, Caswell thought it was a clerical error, a mistake that could easily be explained and quickly cleared up. What constitutes “reasonable” remains one of the issues to be decided. Caswell said he installed security cameras, makes photocopies of customers’ identifications and records their vehicle registration plates, and has provided motel rooms to Tewksbury police conducting surveillance during investigations. The Institute for Justice says it has been calling attention to abuses of the civil forfeiture law for years. In 1986, the year after the US Department of Justice’s asset forfeiture fund was created, the account took in $93.7 million, according to the institute. Today the fund, which holds the proceeds from properties forfeited under the law, holds more than $1.6 billion, the institute said. Between 2000 and 2008, equitable sharing payments from the Department of Justice to state and local law enforcement agencies doubled, going from about $200 million annually to $400 million per year, the Institute for Justice states in a 2010 report. Caswell said he had been planning to spruce up the rooms when the case began. But the government has placed the equivalent of a lien on the property, and he had to spend $100,000 on legal fees before the Institute for Justice took up his case last year.